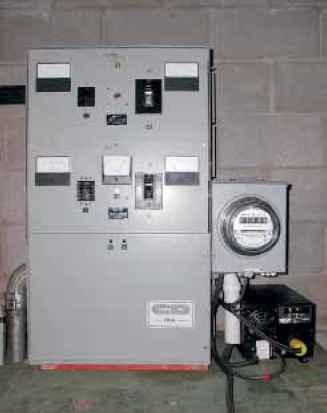 Kilowatt for kilowatt, using water to spin a generator or alternator has long been recognized as the most cost-effective way to make electricity. Given that fact, it comes as no surprise that most home power folks who have the potential to generate hydroelectricity do so. By far, the greatest number of these DC generating hydrosystems use a common automotive-type alternator, just like the one under the hood of your favorite go-mobile. Let's take a look into an alternator and see what makes it work. To understand how an alternator works, let's review some electrical fundamentals. When you pass an electric current through a conductor, such as a copper wire, concentric circles of magnetism are created around the wire. As we increase the current in the wire, this "magnetic field" grows in strength or intensity. Unfortunately, no matter how much current we pass thru a straight conductor, the field around it is too weak to be of value for most applications. If we take this straight conductor, however, and wind it in a series of loops to form a coil, the magnetic field intensifies greatly and "poles" are produced at each end of the coil. These poles are called North and South. The magnetic lines of force leave the coil at the North pole and re-enter the coil at the South. 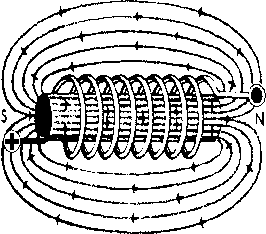 If we take an iron core and place it inside this coil, the magnetic field produced by current passing thru our conductor is intensified further still, since iron offers a much easier path for magnetism to pass through than air, the magnetic lines squeeze down, become more concentrated, and stronger. Now we've got something to work with! The stator is really nothing more than 3 wire conductors spaced evenly around a ring of iron. Which gives us 3 of the coil/core combos with the ring of iron acting as the common core for all the windings. Each of the wires is formed into a number of coils spaced so that a coil of wire made from conductor #1 is followed by a coil from #2, followed by #3, followed by a coil from #1, and so on. This is known as a 120° (apart) three-phase winding. On most automotive alternators, one end of a coil is tied together with an end of each of the other coils of wire and is grounded to the frame. The three remaining ends go to the diodes. The brushes sit on the slip rings of the rotor and maintain electrical contact with the field coil while the rotor is spinning. Wires connected to the brushes and to a battery provide the field current necessary to make the field magnetism of the rotor. When we provide a small field current to the rotor and spin it, whether by water pressure or the fan belt of your Chevy, a strong magnetic field is formed at the rotor fingers or poles. As the rotor passes by the loops of wire in the stator, the magnetic field cuts across each wire, causing voltage and current to be "induced" into these stator windings. Because the poles of the rotor alternate first South, then North, then South again, etc., the voltage induced into the stator windings also alternates between "+" or positive, zero (between poles), and "-" or negative. In the stator of our alternator, remember, there are three separate windings each consisting of many loops of wire. As the alternating magnetic field from the rotor passes by each winding, a separate voltage, or "phase" is induced in each conductor. Since we have three such conductors in our stator windings, three phase alternating voltage is produced. Why three phase and not just single phase? Well, you could. In fact, the 110 vac alternator in Gene Strouss' hydrosystem has many coils of a single conductor in its stator. Its output is 110 vac single phase - standard home lighting and appliance power. In our automotive type alternator, however, weight and size are factors. The 3 phase arrangement also gives somewhat more output at lower RPM than single phase and because the phases overlap one another, the voltage waveform after it's been rectified to DC is smoother. In our alternator, 6 diodes, arranged in 2 banks of 3 each, take the ac voltage and rectify it by passing only the negative half of the ac waveform to ground and passing the positive half to the "+" output terminal of the alternator and hence to the battery. That's it! Author: Bob-O Schultze, Electron Connection, POB 442, Medford, OR 97501 • 916-475-3401. Bob Starcher in Fort Jones, CA. A 1200-gallon water storage tank with Flowlight SlowPump & 4 ARCO Photovoltaic modules. Which is one of the efficient in generator and alternator?